My favourite meal of the day is breakfast. I could have breakfast foods for every meal and be a very happy woman, but that doesn’t mean I’m munching away on sugary cereal every day. Most mornings I treat myself to a fruit and vegetable smoothie that gives me the energy boost I need to start the day, but sometimes I forget to wash the blender need a change in the mornings and decide to make something else. Today was one of those days! I wanted to have something filling and healthy for breakfast, and I wanted it to be delicious too, and here is what I came up with from the ingredients in my fridge. A healthy and filling breakfast for under 300 calories. Heat a small frying pan at medium on the stove top. Beat the eggs, milk and salt and pepper in a bowl until mixed. Pour the mixture into the pan. Let sit for one minute before adding anything. Add the salsa, spreading it evenly over the pan. Sprinkle the crumbled feta cheese over the egg mixture. Place the spinach leaves on top. Let it sit in the pan until the outside edges of the omelette start to brown. Cook until the open edge of the omelette is no longer watery. This could also serve two for breakfast if you add a fruit salad on the side. It was just for me this morning, so I ate it all myself. Lucky me! That sounds amazing!! I am still trying to master a perfect omelette, yours looks perfect!!!! I am gonna have to make this for myself for breakfast tomorrow! Nice looking omelette! I like everything in it except the spinach but I am sure I can find something else to substitute. Thanks for the recipe! Honestly, I’m not a fan of spinach either, but it has a lot of great health benefits. The other flavours in the omelette completely drown it out, I promise! I also put it in my smoothies so I don’t have to taste it, lol. I’m not a huge fan of spinach, my dad use to make me eat it when I was a kid. He told me it would put hair on my chest.. it took me a few years to realize I didn’t want hair on my chest. This omelette looks tasty, I’ll have to give it a go. Thanks so much for sharing. I never thought to put spinach in an omelet. Yummy! That looks delicious! I’m going to try this in the am. I thought I made a pretty good omelette until I read about yours and saw the finished product…….honestly, how tries did that take? Just one 😉 I won’t say they always look that nice though, lol. I’m a huge breakfast fan as well. I don’t eat what I’d like as much though. I love making eggs for breakfast. My sons favorite omelette is one loaded with cheese. Wow! This came out beautifully! sounds delicious! Looks so good. I am a horrible flipper yours looks perfect. That looks yummy !!! Gonn have to try this next weekend.. I love salsa cheese and soinach.This is an awesome and delicious way to start the day.Thanks so much for this recipe. We love omelettes in our house! I think my favourite kind is with asparagus and parmesan! I would so eat it all by myself too! Love eggs in many forms and adding cheese to an omelette is the best! Id have even added black olives to go with the feta/spinach theme. I wish my omelettes came out this nice! I can never flip eggs properly to make a neat looking omelette but will give it a try this week! This looks like a perfect choice for when I am on my own for dinner! Especially, the spinach and feta. This looks so yummy!! Wonderful! Great idea to add the spinach. It’s a painless was to add more leafy greens to my diet. Thanks for the recipe. I’ve been having a spinach and veggie scramble every morning but this looks like a nice change. I’ll have to try it with feta. I always use cheddar or pepper jack! 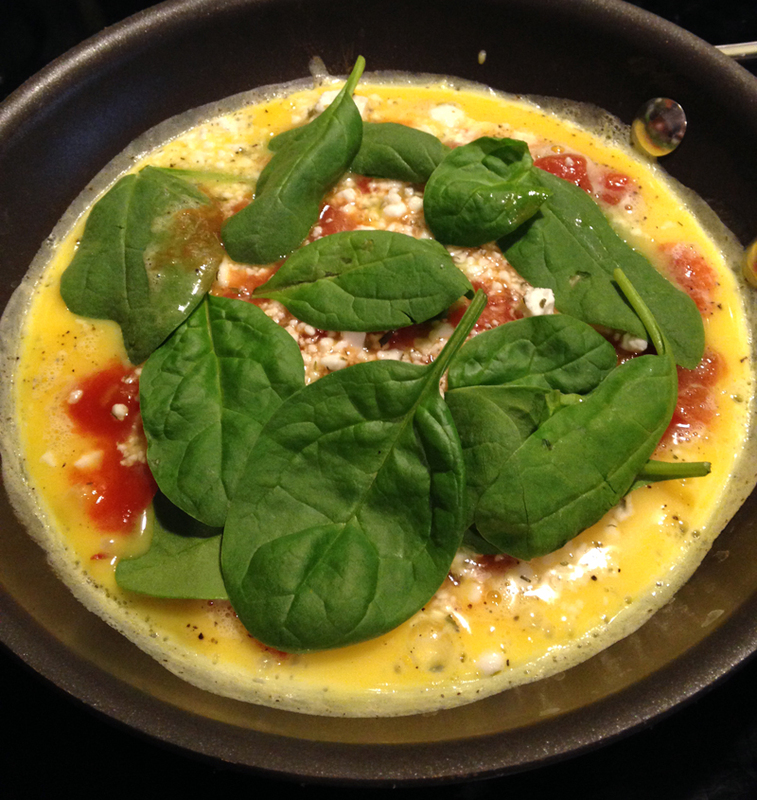 I never thought to put spinach in my omelet before. I just so happen to love both. I’ll have to suggest this to my husband. He loves omelets and we have spinach and salsa in the fridge right now. I can’t wait to try this.I think it will be as delicious as it looks and I love all the ingredients.Thanks so much for posting this. What an awesome looking omelet! And so healthy too. This looks so good. A real must try. Yum! Looks great! Never would have thought to use spinach. 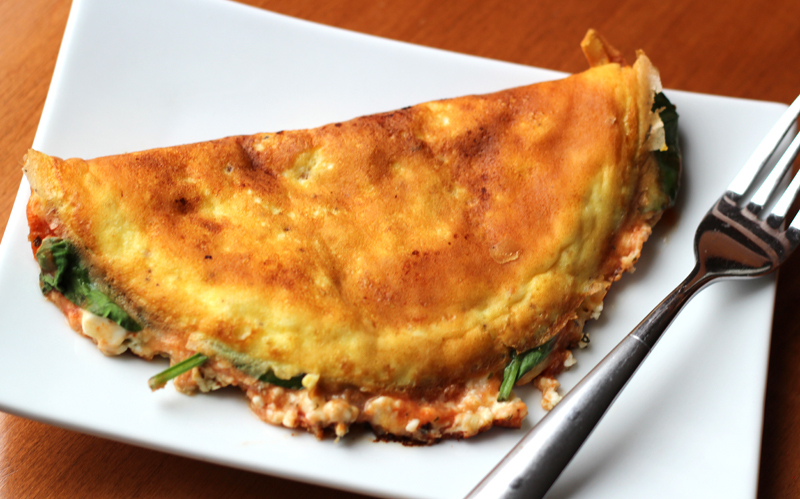 I would love a Spanish Omelet right now! I have never added spinach to omelettes but i am always looking for ways to add it to a meal,i will try this next weekend,thanks for sharing it sure looks delicious ! Thanks,we did enjoy the added Spinach.